Though their numbers are undeniably dwindling, it seems that every time I go to a Bomber Command-related event I come away having met a new veteran or two. 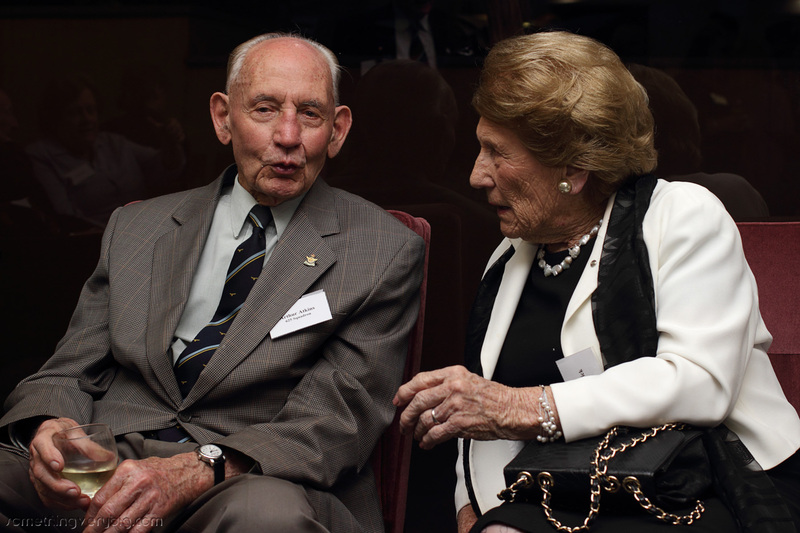 And last Saturday night, a fundraising cocktail party for the Bomber Command Commemorative Day Foundation (Vic) in Melbourne, was no different. Because of my own history of living in Sydney most of the events I go to are still in the Harbour City, and so despite living in Melbourne for four and a half years now I regularly travel there for ANZAC Days or other events. 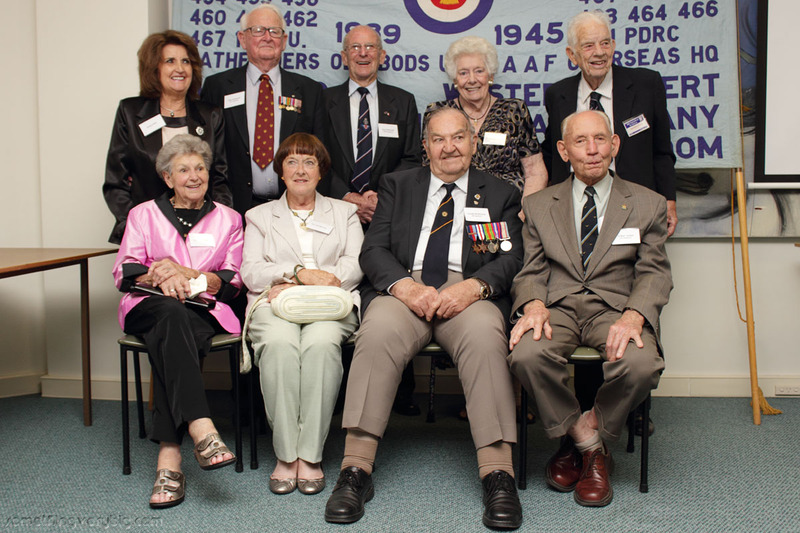 Consequently I’m still getting to know the Melbourne-based Bomber Command community. 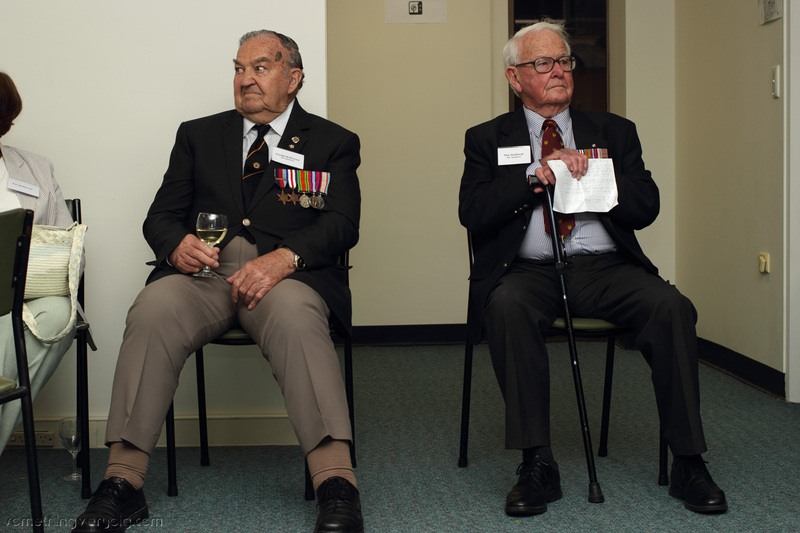 So it was great to see that among the fifty or so guests who gathered on Saturday night at the Nurses’ Memorial Centre on St Kilda Road were five Bomber Command veterans, three of whom I had not properly met yet. Rest assured that was remedied by the end of the evening! The other two I know well. 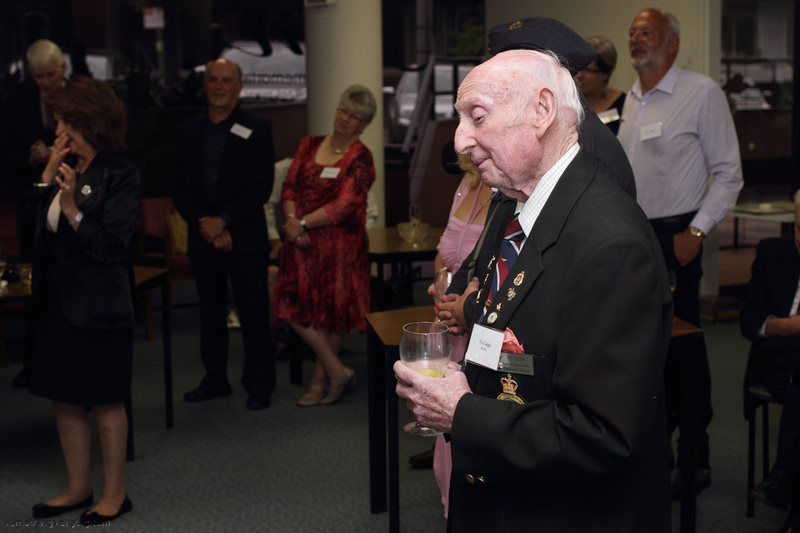 578 and 466 Squadron Halifax skipper Don McDonald brought his wife Ailsa, and was working the room as he always does. Though he was wearing a badge with joined Australian and French flags I didn’t get the chance, unfortunately, to ask him about his recent award of the Legion d’Honneur, but that story will have to wait until the next time we meet. 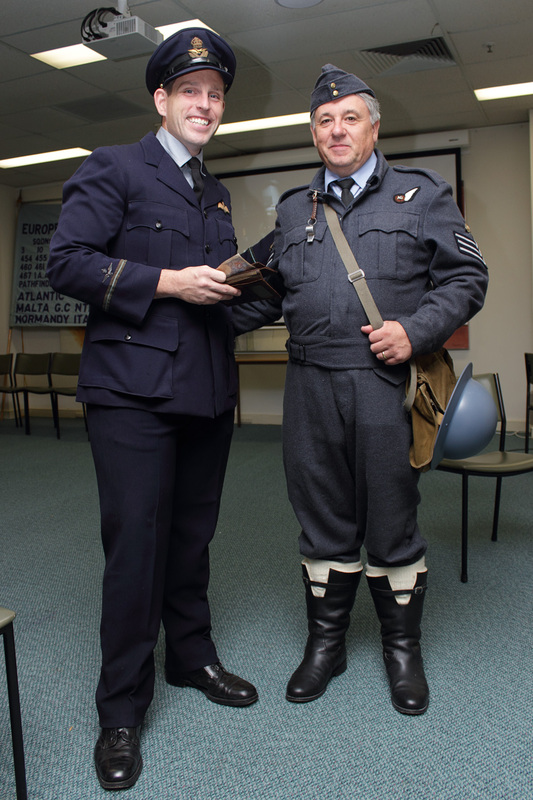 463 Squadron navigator Don Southwell came down from Sydney as a representative of the national Bomber Command Commemorative Day Foundation committee. 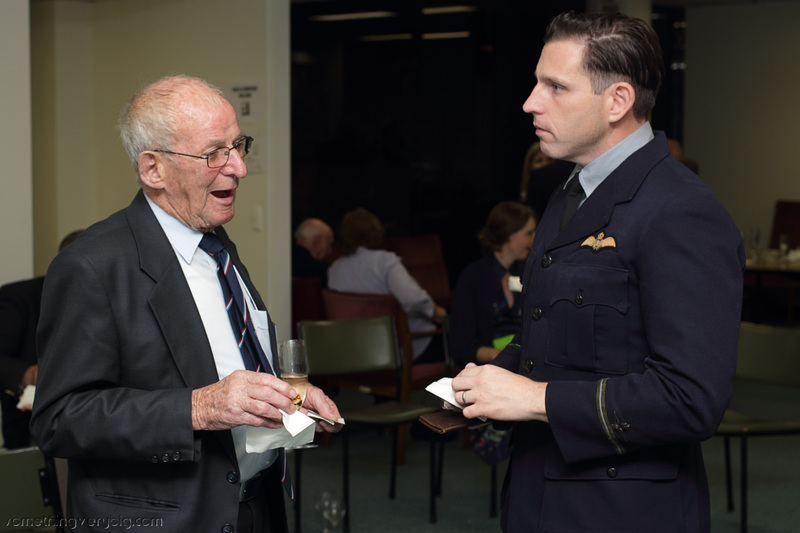 Don, as well as being a friend of mine is very active on numerous Bomber Command committees and it was nice to have the chance to talk to him at an event which, for once, he did not organise. The other three are all Melbourne veterans. “Poor old Wally McCulloch”, as he introduced himself, was a 460 Squadron bomb aimer. He and his wife had braved a long and difficult journey to get to the function… from their apartment upstairs in the same building! And Arthur Atkins was a 625 Squadron pilot, with a DFC. He approached me after Don Southwell pointed me out as someone with a 463-467 Squadron connection, saying he had a mate who was lost flying from Waddington. I’d briefly met the third Melbourne veteran, Gerald McPherson, at the panel discussion at the Shrine of Remembrance in 2013 but, until now, had not had a chance to talk to him. 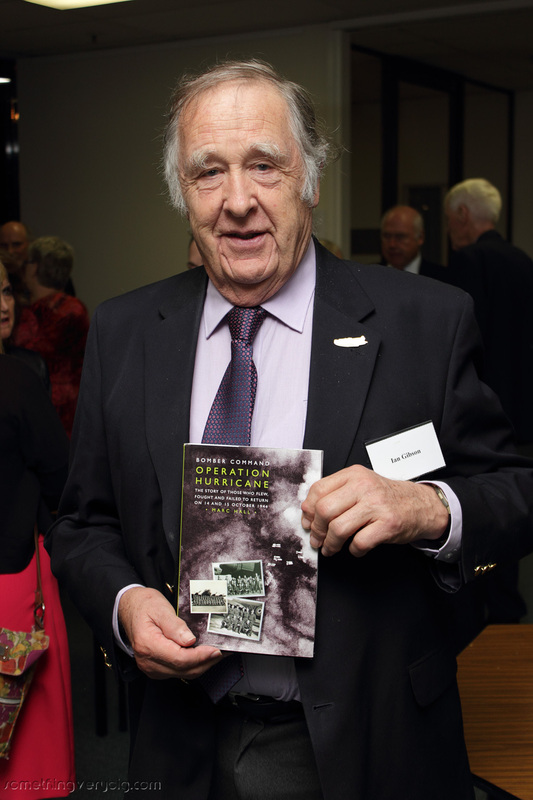 He was a rear gunner in 186 Squadron and related the story of his first ever trip in a Lancaster. 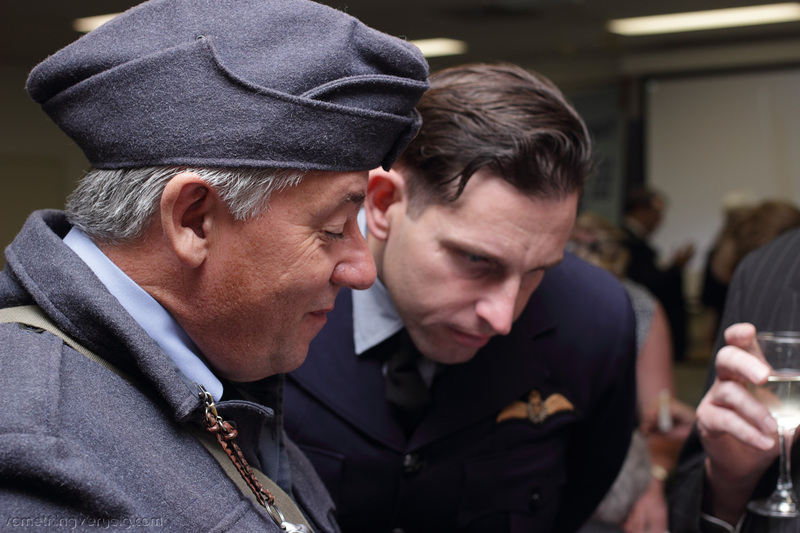 Up to that point, he told me, flying Wellingtons and Stirlings, he’d always said a small prayer to himself at the top of the runway to help the aeroplanes take off safely. “I never needed to do that in the Lanc”, he said. “You could feel the power as it took off.” He was wearing a Bomber Command clasp so we talked about that for a little while. Coincidentally I had dropped the application for my great uncle Jack’s clasp into the postbox as I was walking to the tram to travel into the city for this event. 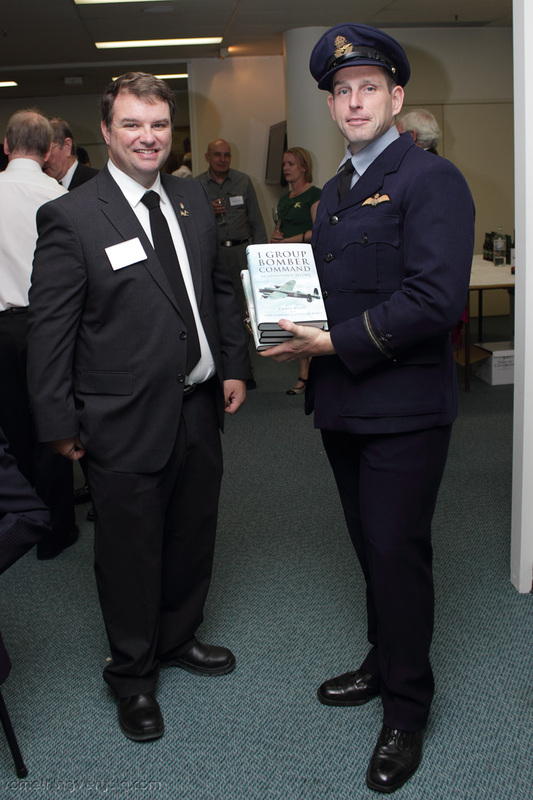 I also, finally, met Andy Wright of Aircrew Book Review. We’ve corresponded before, mostly about blogging and book-ish issues, and we’ve been trying to arrange a time to catch up since he moved to Melbourne from central NSW with his young family a few months ago. This cocktail party offered a good chance to meet. Very generously, Andy had used some of his publishing contacts to source for us some very nice books for our raffle. Thanks to Capricorn Link (Australia) and Pen and Sword Books (UK) for their very generous donations. 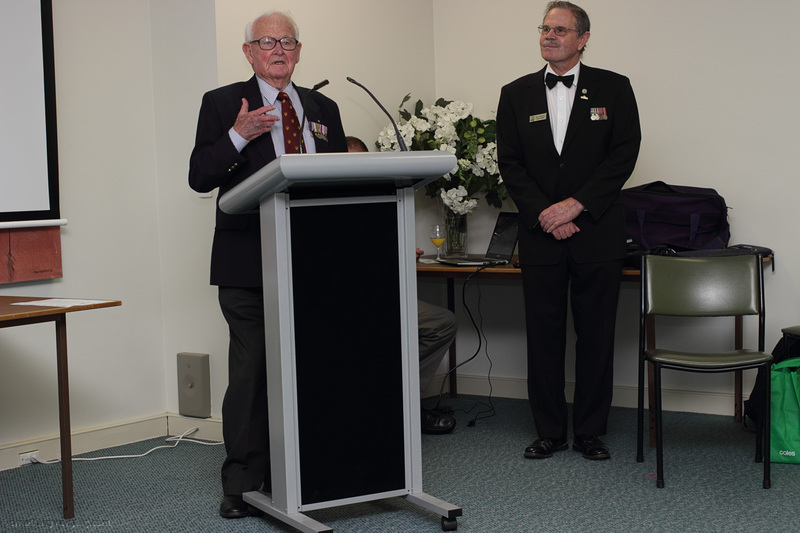 And I must also mention the Royal Australian Air Force Association (Victoria), whose treasurer Richard Orr announced a significant donation of funds to the group on the night. And at the end of the day, fundraising was what it was all about. The Bomber Command Commemorative Day ceremony gets bigger in Melbourne each year, and it is beginning to cost a fair amount to put on. The aim of the cocktail party, as well as being a good chance to bring together people with an interest in Bomber Command in the city, was to raise money to ensure that the ceremony – set down for June 7 this year – can continue to be held. In this it was a success, and I think a good night was had by all. One last thing, before I get stuck into some more photos. I wrote back in January about a programme run by the Shrine of Remembrance to connect veterans’ groups with schools, to pass the legacies of some of these groups on to a new generation. I’ve been holding this news back for a while now but, as it was effectively announced publicly on Saturday night, it’s time it got a run on SomethingVeryBig. 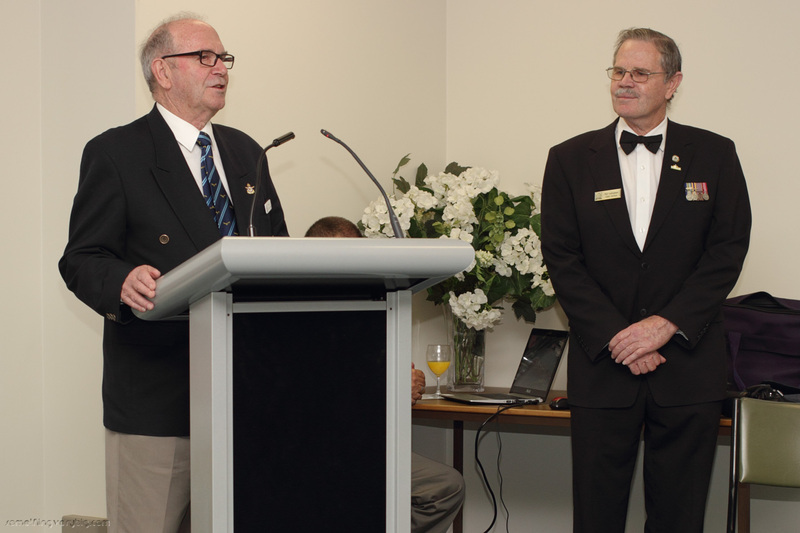 The Bomber Command Commemorative Day Foundation (Vic) is now part of this important Shrine initiative. Carey was the school attended by Frank Dimmick, who was a 460 Squadron navigator and the husband of Jan Dimmick, one of my fellow committee members. 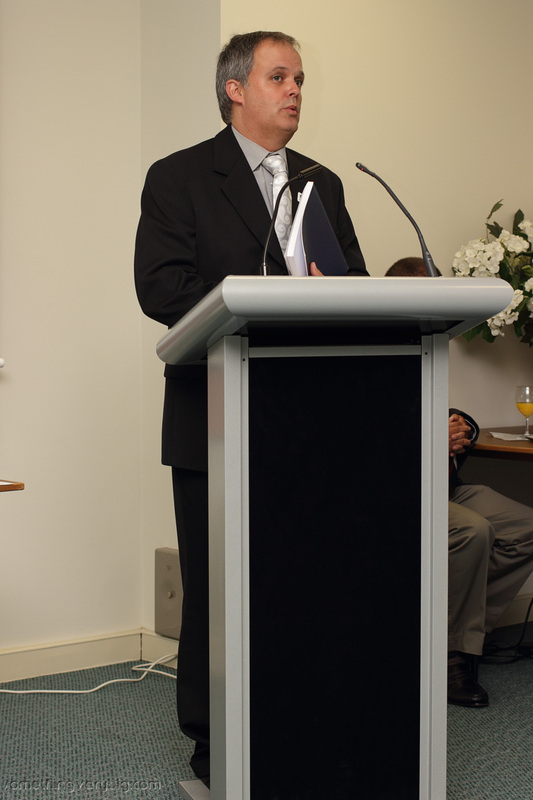 Though Frank died in 2013 Jan has maintained contact with Carey’s Old Grammarians network and it is through this association that the school was approached and agreed to become part of the ceremony each June. Scott has been the main point of contact, and his enthusiasm for the project is infectious. He’s effectively thrown the resources of the school at our disposal. Year 9 students will learn about Bomber Command as part of their history studies and Carey students are expected to take an active role at the ceremony in June. Let’s hope it’s the beginning of a long and mutually beneficial association between the two groups. Vic Leigh of the Royal Air Forces Association (Melbourne Branch). He is a veteran from an RAF Mosquito squadron but served in Australia and the Pacific, and so very modestly refused to appear in the group photograph. Lovely bloke though! Don Southwell. Ron Ledingham looking on.